The end of August always means hay delivery time. Second cuttings of the hay fields are going on, weather permitting, all around us. We’ve gotten two deliveries of hay so far, and will be getting some more to last us through the winter and on until next August. Gabriel and mom Francesca enjoying a new bale of hay. 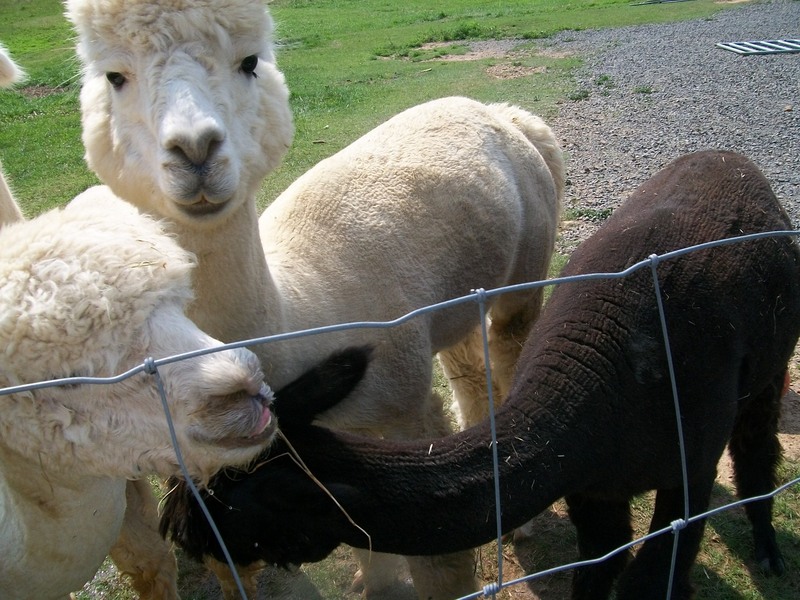 Alpacas are very efficient eaters, needing to eat only about 1-2% of their body weight per day. Since alpacas weigh on average about 150 pounds full grown, that is only 3 pounds or less a day of grass, hay and grain. Even in winter a sqare bale of hay a day can feed a pasture of about 14 alpacas. Today, two of our sweet geldings moved to their new home. Sensational Mahogany, “Mac”, and Cinnamon’s High Noon, “Noonie”, have been favorite members of our farm, but are now going to become part of a new family. 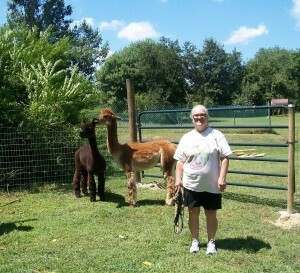 Debbie Simmons and her family are looking forward to having these lovely boys as pets and to allow her grandkids to grow up around these sweet alpacas. 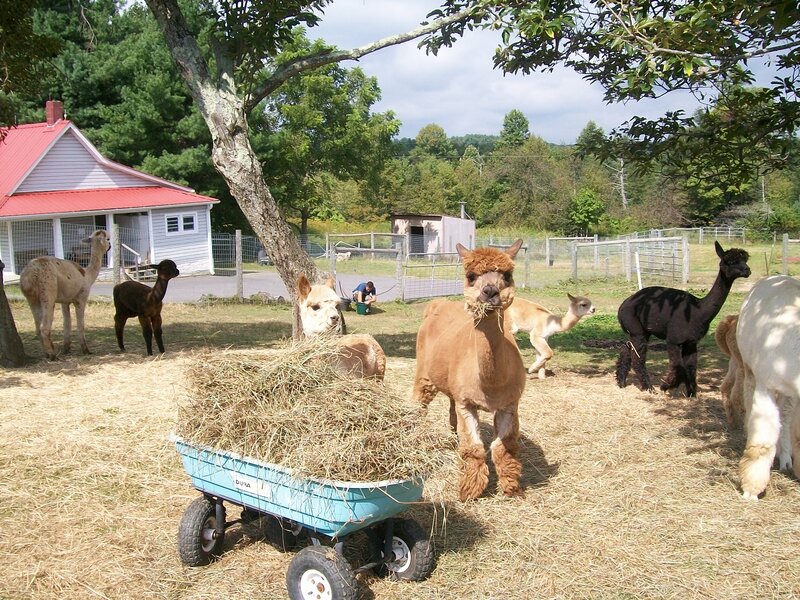 We always miss our alpacas when they move on to new farms, but we are glad to see them go to a farm where they will be loved as much as they were here. Can you have an alpaca farm without owning a tractor? Yes, you can. 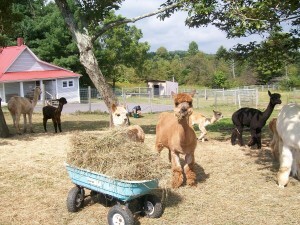 We have grown our herd of alpacas from 17 to 51 over the past six years with no tractor. We have had a lovely little riding lawn mower that we called a tractor (to increase its confidence) who has done hauling and bush hogging in addition to its normal grass cutting duties. It has done remarkably well over the years no matter what we asked of it, but we finally reached the point where the work load was getting too much for us and our little “tractor” to keep up with. This week we purchased a new Kubota tractor with a scoop in the front and a rotary cutter for cutting our pastures and brushy areas. Already we are amazed at the time it has saved us. 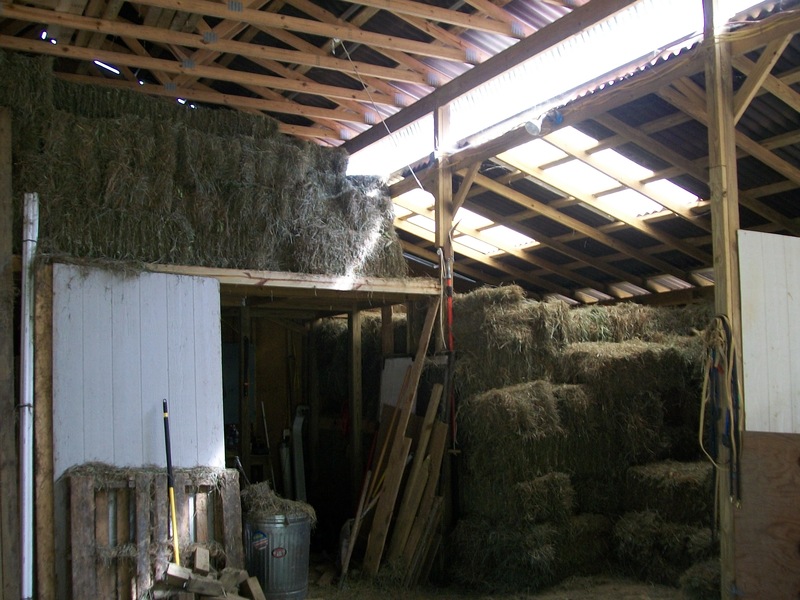 It will allow us to keep up with cutting weeds that sprout up in the pasture as well as have time to work on clearing some of our 27 acres that is still overgrown. And that scoop has already come in handy with turning the paca poop compost and other jobs around the farm. 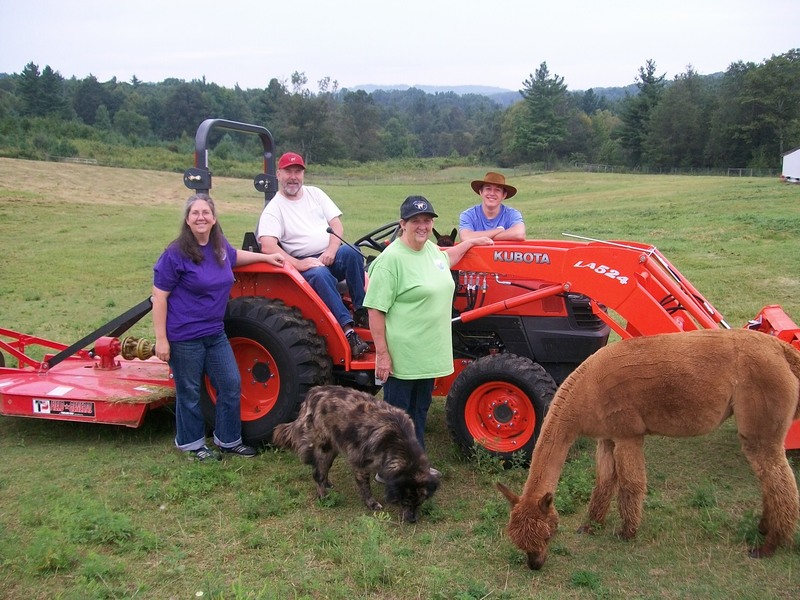 The whole family loves the new tractors, even the alpacas who are quite curious about this big new orange pasture mate. 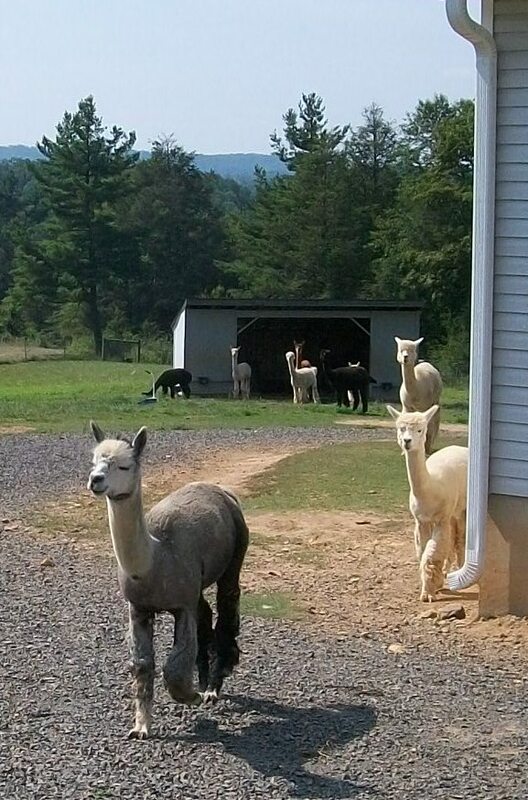 So, can you have an alpaca farm without owning a tractor? Yes, but it is a whole lot easier with one. 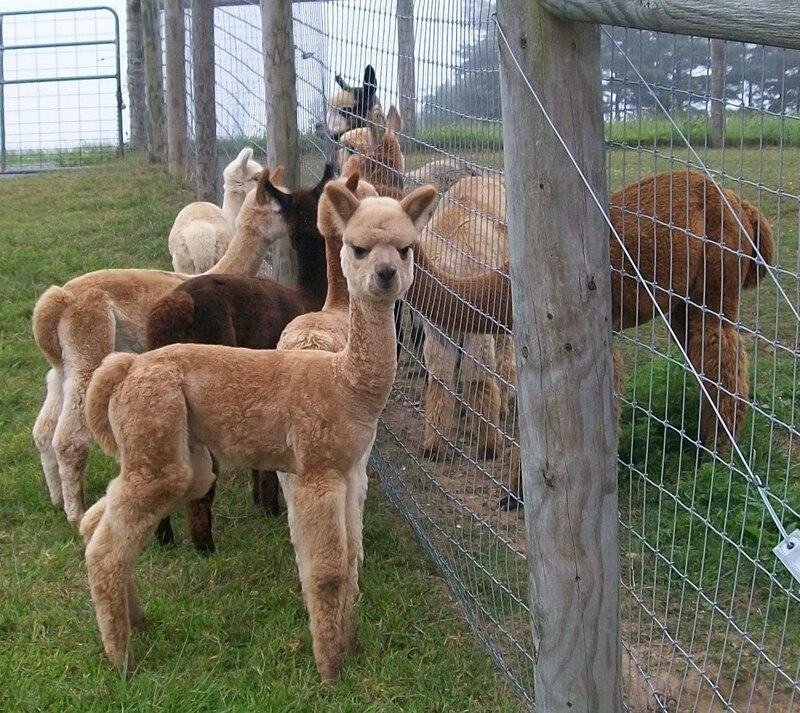 One of the most fun things about alpaca farming is watching our new batch of crias each year. This year, Peaceful Heart Alpacas had five beautiful alpaca crias born in May and June. They are all getting big now and more and more independent from their moms. In the mornings we often let the mamas and crias out on to the parking area around the store to keep the grass trimmed. The crias all have a great time running around and playing as their moms eat. Alpaca crias love to play. The little girls particularly like to run, but the boys love to wrestle. 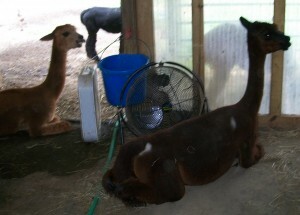 I put a new video up on our Facebook page, www.Facebook.com/Peaceful.Heart.Alpacas. (You don’t have to be a member or even sign-in to Facebook to see it.) The video is about 1 minute and 40 seconds long and shows Milton (white) and Gabriel (fawn) wrestling. After a little while, Milton’s little brother Becket comes up to join in, but Milton lets him know quickly that he is not invited. Becket soon gets over his disappointment and starts playing with a weed he finds. I just enjoy spending time watching the crias play. We had a wonderful time weaving alpaca shawls on the triangle loom last weekend. Everyone had beautiful designs and they turned out great. The weekend was a great time to relax among the alpacas and learn a new fiber art. 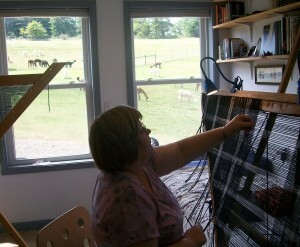 You can see pictures from our weaving class on our Facebook page. 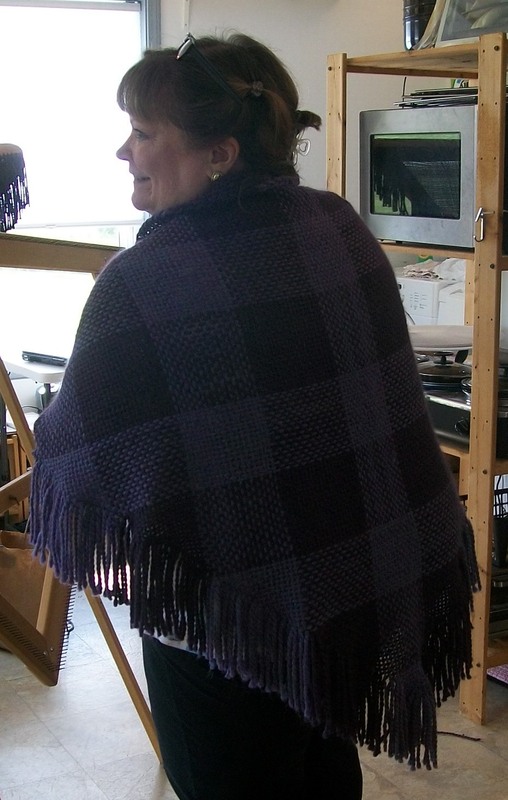 We will be wet felting on Saturday, August 20, making felted vase covers and wine woozies in the morning and unique wall hangings during the afternoon. There is still room in all three classes. I hope you can join us. Learn more about these and other classes online. See the detailed description for pictures and descriptions of each project. Like most of the U.S., we’ve had a warmer than usual summer at the farm. 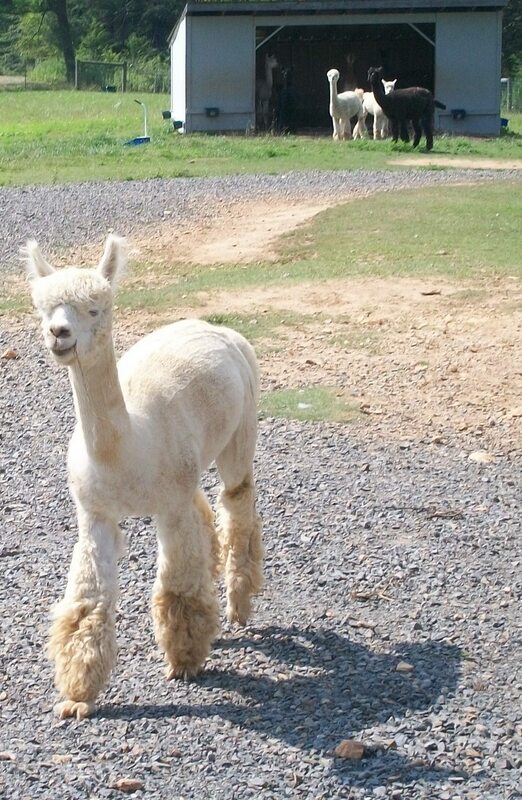 So, how do the alpacas cope with the heat? In general, they seem to prefer cooler weather, but they have some good strategies to deal with the hot weather. 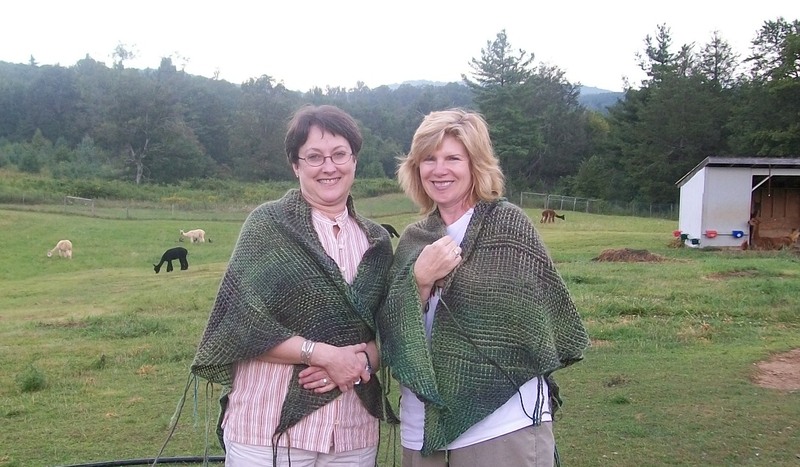 Early mornings and late evenings are the times that you are most likely to find the alpacas grazing in the pasture and the crias running around and playing. Once it starts to warm up, the alpacas head for a shady tree or into the barn where we have multiple fans set up to help them stay cool. There you’ll find them chewing their cuds or munching on hay. Occasionally, though, they just can’t seem to resist absorbing some sun rays (and vitamin D) by sunbathing. 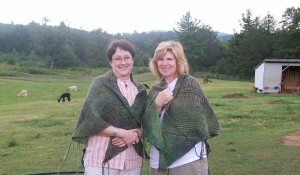 You will look out and find one or more alpacas sprawled out in varying degrees of modesty. Most will lay on their sides as seen here in the picture of Trixter, who was joined by our dog Fancy Girl. Occasionally, we get a funny alpaca who really gets into her or his sunbathing and wants to make sure that every inch of their belly is sunny side up. 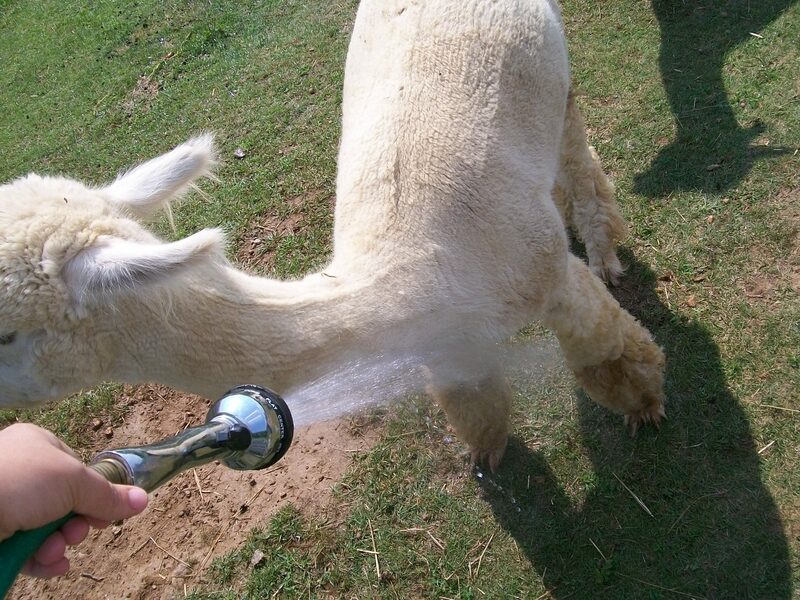 I think the favorite way of almost every alpaca on the farm to cool off is to play in the hose. Usually, turning on the water is enough to draw a crowd. In the pictures below, I went out to fill water buckets and spray down the alpacas. Lance was the first to notice what I was up to, so managed to get the hose all to himself for awhile. The others quickly figured out what was going one and ran over to get in on the fun. 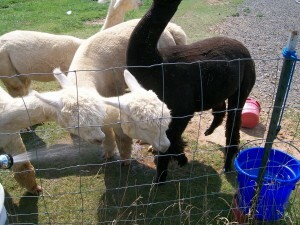 Several of the alpacas enjoy drinking right out of the hose. In general, the alpacas’ most successful strategy for dealing with the heat is having well-trained farm hands.